The unnamed Empire State Building-based skyscraper in GTA III. 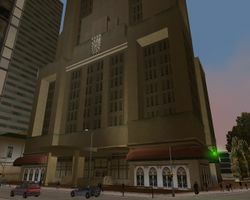 The unnamed Empire State Building equivalent in Grand Theft Auto III, Grand Theft Auto Advance and Grand Theft Auto: Liberty City Stories refers to a towering skyscraper on the eastern fringe of Bedford Point at the border with Torrington, in Staunton Island, Liberty City. The ornate base of the building in GTA III. Bearing several minor similarities with the real-life Empire State Building in New York City, it is the second tallest structure in Liberty City, with a height of 391 m (1,282.8 ft), and is a prominent feature of Staunton's skyline. The building's position as the second tallest in the city may be a reflection of the Empire State Building being the second tallest building in New York City circa 2001 behind the World Trade Center prior to the September 11 attacks. Unlike the Empire State Building, the GTA equivalent is only similar in design by its tapering profile, but otherwise features a completely different facade design and appears much thinner, like an obelisk; the only hint of the building's Art Deco styling (a feature very prominent on the Empire State Building), is only vague present on the street level entrance of the building. Rotterdam Tower, the GTA IV generation equivalent. This page was last modified on 26 March 2012, at 23:46.